Everything seemed possible, and people strove to be modern. With the aim of bringing modern design into American homes, George Nelson conceived a wide array of everyday objects: lamps, clocks and other domestic accessories. 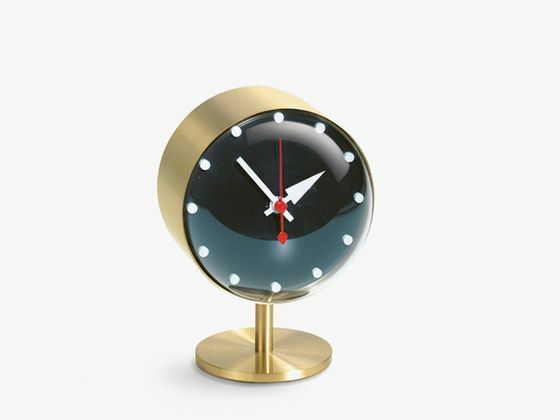 Up until the 1970s, the Nelson office created many different items for the home, including the Bubble Lamps and the Ball Clock, which became icons of mid-century modern design.The Desk Clocks are available in a diverse range of shapes and materials. Equipped with high-quality quartz movements, they continue to offer a refreshing alternative to conventional clocks. Brass, acrylic glass, polyurethane, solid walnut.